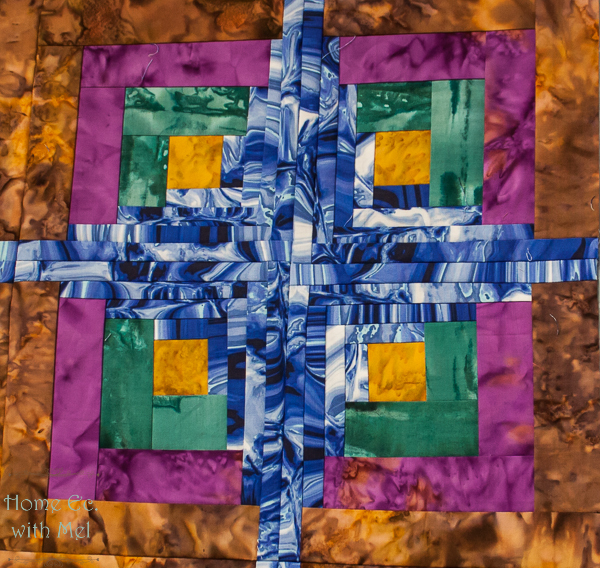 Today, we are looking at how to turn the Twisted Log Cabin block into a quilt. 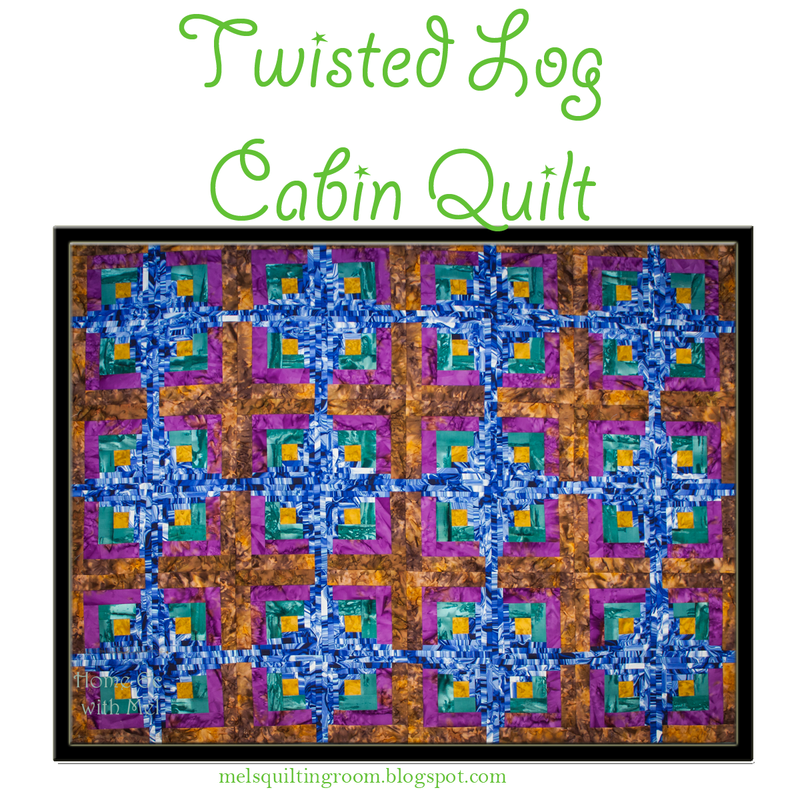 The twisted log cabin quilt is super quick to put together. It finishes at about 46 1/2 inches by 62 inches. It's a nice sized lap quilt or couch quilt. It's also just as easy to make as a regular log cabin quilt! Even though it's super easy to put together you get the illusion of a circle. People will think you did a lot more tough work than you really did. That's what we always want, people to think what we make is much harder than it really is. It's like the old rice krispie cookie commercial where the mom tossed flour on her face so people thought she worked harder than she really did. This post may contain affiliate links. Shopping via these links costs you nothing and adds a few pennies to the fabric budget. Paul actually sewed this quilt. 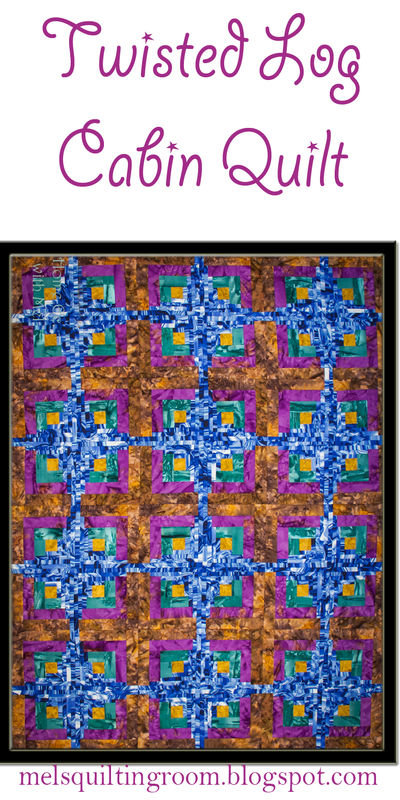 He had gotten the batiks a while back and had been looking for a quilt to make with it. When he saw my sample he knew it was the quilt to make with his fabric so he volunteered to sew the quilt up for the blog. It's so nice to have someone to help out in that way. I do include some extra fabric so you can square up your fabric and in case you goof while cutting. There is also some extra fabric cut in case you goof or if you leave more room than I do when you assembly line sew. The final quilt doesn't have an added border. If you would like to border it you'll need extra fabric to do so. You need to make 48 squares like in the video below. The layout of the quilt is simple too. I sewed mine in groups of four, with the skinny strips facing in and round 3 of the wide on the outside. You'll get a cross of your contrast in the middle. You should end up with 12 of these larger blocks. The final quilt is a 3x4 layout of the larger units. This quilt was a breeze to make. It's been hanging on one of the design walls for awhile now and everyone who sees it just raves about it. The batiks really help to make the design pop. Thanks again to my sewist on this project Paul. While I was busy doing other things he took my pattern and made this quilt. What a beautiful quilt! I love the colors! I have never heard of the twisted log cabin so found this very interesting - pity I'm not good at that sort of thing. What a beautiful quilt! I hadn't heard of a twisted log cabin before. Very interesting and quite a colorful quilt. Did you try other layouts before you settled on this design? Thanks for sharing! I did try some other layouts but this is what I liked best. Thank you for this terrific tutorial! I love it!